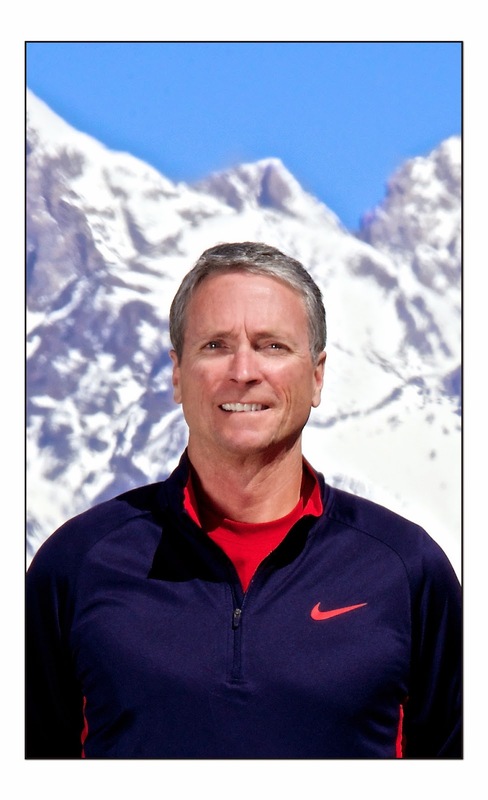 (Reposted from the Mountain Weather column in Aug. 6 Jackson Hole News & Guide). I heard some complaining in late July that it was “too hot”, which sparked some memories of Julys not so long ago, which truly were “hot”. This July was not. That also prompted me to dig back through the records to see which Julys were the hottest here in Jackson. What I found may surprise you, or at least it should cause you to apologize for any whining you may have done about the heat this July. To no one’s surprise, July is normally the hottest month of the year here in Jackson. Our average high temperature in July is 82 degrees (actually 81.8) over the last 80-some years of climatological record. July of 2014 had an average high temperature of 80-degrees, two degrees below normal. There was one day this July (the 23rd) that some thermometers in town hit 90-degrees. However, the highest temperature recorded “officially” at the Town of Jackson Climate Station was 87-degrees. Close, but no 90-degree readings this July. As a matter of fact, upon further investigation I discovered that we have not seen a temperature reading of 90-degrees at the Jackson Climate Station since August 1, 2008. Prior to that, there were quite a few. Probably the best way to gauge a “hot” July is to look at the average high temperature for the month. Another way is to count how many days we hit 90-degrees or above, which usually coincides with those average high temperatures. Prior to the early 2000’s, July of 1988 was the hottest July on record. That was the famous summer of the Yellowstone Fires, and the average high in Jackson was 88-degrees (actually 87.6). We had eight days with high temperatures of 90-degrees or warmer that July. I should also mention there were four days that weather readings were not recorded in July 1988, which might have pushed that average even higher. Then along came July 2003, which set the new record with an average high of 90-degrees (actually 90.2). There was a whopping 17 days that July with high temperatures of 90-degrees or warmer, more than twice as many as in July 1988. There were no missing days of weather readings that month. Other Julys of note were: July 2007, with an average high of 88-degrees and 13 days that went into the 90’s. And also July 2000, which had an average high of 87-degrees and 11 days in the 90’s. From Jackson, WY Climate Station records. Note, there were no records for 2012. In order to be included in the monthly average temperature record, there cannot be too many missing weather readings. Months that have five or more missing days are not considered when calculating our averages. There is a July in our official climate record that was likely even hotter than 2003. Unfortunately, there were too many missing days in the record, but I thought it interesting enough to give it an honorable mention. That was way back in July of 1934. The climate station at that time was located somewhere in the valley to the south and west of town. The observer was Albert Butler, and I would love to know if anyone related is still living in Jackson. Perhaps Mr. Butler was too busy haying his fields that July and he missed his daily weather readings 11 out of 31 days. Yet, of the remaining 20 days, he did record 14 days with high temperatures of 90-degrees or hotter. His average high temperature in July 1934 was 92-degrees (92.5 actually). But here is the real kicker, he recorded two days that month, on July 17 and 20, with a high temperature of 101-degrees. And that is the highest temperature we have, for any month, in the official weather records for Jackson. I did not have time to go back through and look at the entire temperature history for July in Jackson to see all the ups and downs between 1934 and 2014. However, there is an obvious trend that you may have noticed if you have lived here for at least the last 15 years. Looking at the average high temperatures in July from 2000 to 2014, we were on the uphill climb with some very warm Julys from 2000 to 2007. Since then, we have seen a cooling trend, from 2008 through 2014. (See graph). If you complained in the early 2000’s about the July heat, it was warranted. If you have complained about the heat in recent July’s, it has been unjustified, because July in Jackson is not as hot as it used to be. (*From Jackson Hole Climate Station historical data). The historic average high temperature in Jackson in July is 82-degrees. 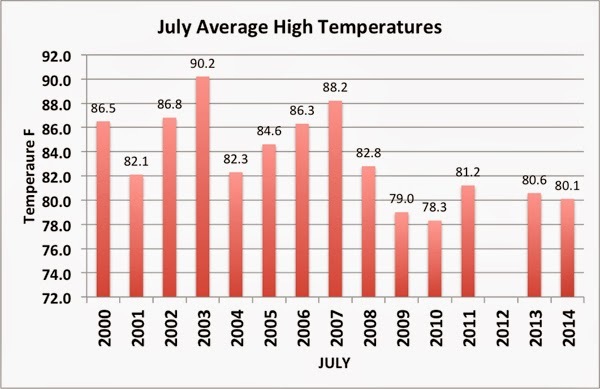 Average high temperature for July 2014 was 80-degrees. No days in July 2014 that were "officially" 90-degrees or warmer. Hottest July ever was in 2003, with an average high of 90-degrees. July 2003 had 17 days of 90-degrees or warmer. The last time we hit 90-degrees in Jackson (officially at the Climate Station) was back on August 1, 2008. Wow! That an interesting thing,temperature scenario generation for probabilistic load forecasting. Was it done with cabled weather stations and gadgets or with portable ones?